New research published in The Journal of Physiology has indicated why people with paralysis of their limbs and torso are more likely to suffer from sleep apnea. This knowledge could be used to develop much-need targeted therapies. A) Transporting participants from the hospital to the test room. B) JV in the test room. Obstructive sleep apnea (OSA) is a sleep disorder in which the upper airway (ranging from the back of the nose to the to the throat area) narrows and closes repetitively during sleep. This can result in major sleep disruption and serious health consequences, including increased risk of high blood pressure and diabetes. In people with tetraplegia, which is paralysis caused by illness or injury that results in the partial or total loss of use of all four limbs and torso, the rate of OSA is over 70%. Currently, the reasons for this particularly high rate are unknown. The development of new therapies could potentially have a large positive impact on health and quality of life. This new research sought to understand the way throat muscles react in those with tetraplegia and sleep apnea. This will help discern why obstructive sleep apnea is so prevalent in individuals with tetraplegia. Volunteers with OSA (with and without tetraplegia) were studied in sleep physiology laboratories in Sydney (NeuRA) and Melbourne (IBAS). Brief pulses of suction were delivered to participants via a breathing mask to simulate the airway narrowing characteristic of OSA, with electrodes inserted into the largest muscle surrounding the upper airway, genioglossus, enabling the measurement of key reflex responses. It was expected that the reflexes would be similar for all those with OSA, whether they were tetraplegic or not, as it was believed that they only involved processes above the injury site. However, this study showed that in several cases of individuals with tetraplegia and sleep apnea, key protective throat reflexes were absent, or indeed led to the switching off (instead of activation) of the genioglossus muscle. 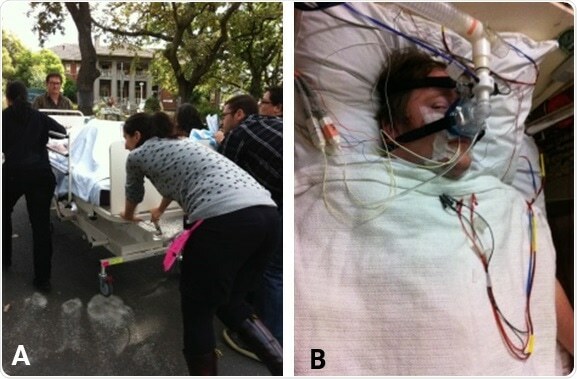 These findings help to explain why OSA is so common in those with tetraplegia and sleep apnea. Due to the fact that this research was conducted in wakefulness and not sleep, the researchers cannot be certain that their findings translate to sleep. Regardless, their observations provide valuable insight into upper airway reflex responses, and pave the way for future physiological sleep reflex studies looking to develop effective and tolerable targeted therapies for those with tetraplegia and sleep apnea. “We were worried that nobody would take part in our long, tedious protocol. However, he just brushed it off like it was nothing: “a 2 mm wide catheter in the nose? What a joke compared to the feeding tubes I had before”! “The experimental day was intense to say the least; six people wheeled his bed up a steep slope to a test room about 100 m away from the main hospital. Somehow we made it through the lengthy protocol together, and it was mostly thanks to him, our first rockstar patient! These participants gave us confidence that this project was feasible, and in the future the data produced will hopefully make their lives a tiny bit easier”.